Just look how proud my little guy is in his new Dinosaur Train polo shirt and shorts! He is a tiny kid, so this size 3 was still a bit big for his little waist. He uses a belt, however, and is beaming at how sharp he looks. There are other pieces in the line, too! You can find this clothing for an affordable price at Kohl's and KMart. We have an entire china hutch dedicated to art supplies. It might be because we homeschool, but it's mostly because my kids love creating more than anything else! We already own several of the Crayola Color Wonder products, so adding in a Dinosaur Train themed product was a natural fit! My kids share this one very well, taking turns coloring one page, and then passing it on to the next kid. 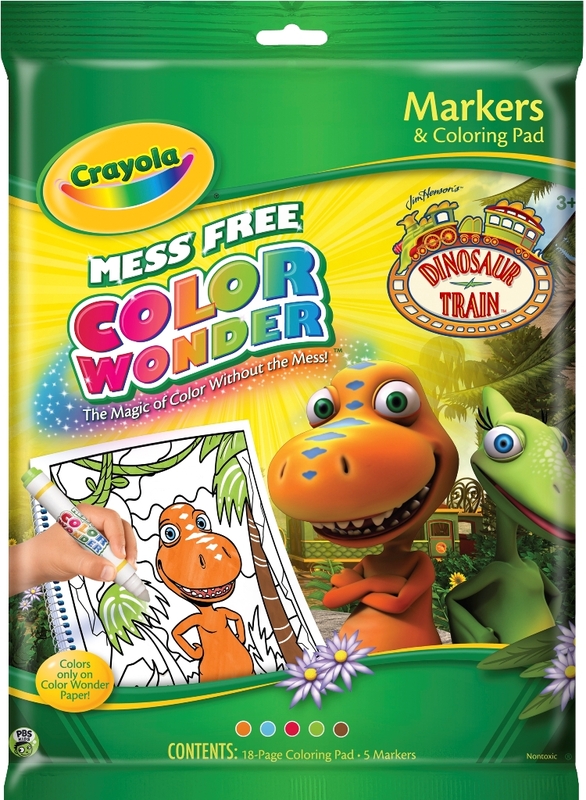 (The markers work with all Crayola Color Wonder products.) These are priced at just $7.99 at Walmart, Target, Toys “R” Us, Kmart, Kohl’s, Meijer and other stores that carry Crayola! As a Mega Bloks Mom, I already LOVE anything in the product line. We own so many of the Bloks, and I figured a Dinosaur Train themed set would fit in nicely. I was right! My son plays with the Buddy figurine and bloks along with his Thomas the Train set. (I laugh when I see him having Thomas talk to Buddy.) 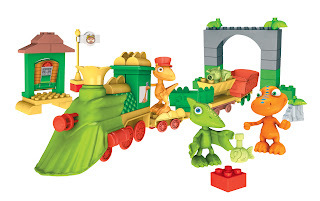 These are super high-quality bloks, and there are a few sets you can mix and match for even more Dinosaur Train fun! Sets start at less than $9 via Amazon, KMart and ToysRUs. We devour books at our house, mostly because I require it for our homeschool program. The younger ones that can't read yet will spend hours staring at the pictures in many books and making up words to go with the pictures. This latest Dinosaur Train themed book is actually a board book, sturdy enough for my infant son, and the kids love finding the letters they know and then matching them up with dinosaurs they think look cool. You'll enjoy how durable this is, and the colors are fantastic! Give your kids an edge to their phonics learning with this padded board book for just $8.99 via Amazon! What about your kids? 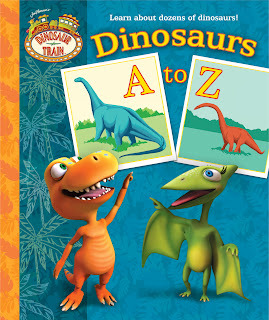 Are they Dinosaur Train fans? Do you buy special products to help ease the transition from summer to school or to just reward your kids for taking the next step in their educational career?